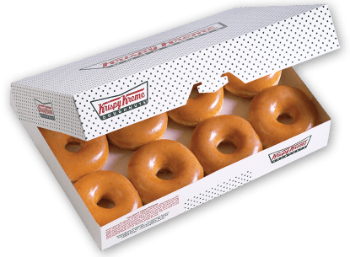 Krispy Kreme: Get One Dozen Krispy Kreme Doughnuts for only $6.99 on March 12-14, 2018! Krispy Kreme Rewards Members can get one dozen doughnuts for only $6.99 starting today, March 12th, through March 14th! Just show your Rewards Barcode in the Krispy Kreme App or your email at the register. Limit 2 dozen per member. Not a Rewards Member? Sign up here for free! « Target: Dentek Floss Picks (90 count) only $0.86!